The big question is, what happens to all the gingerbread and lollies after it’s taken apart? 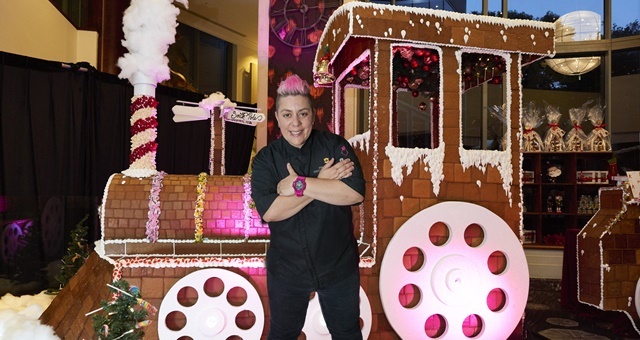 Festive season is underway at Shangri-La Sydney, with guests and visitors encouraged to call in to the hotel to see a giant gingerbread train created by celebrity pastry chef Anna Polyviou. Measuring four metres in length, the multi-carriage train is made from over a tonne of gingerbread bricks, half a tonne of lollies, 11 kilograms of fondant, hundreds of giant lollipops and candy canes, covered in parts with icing sugar. Joining forces with Polyviou once again for the Christmassy creation was “cake engineer” Verusca Walker, who had worked on many other giant sugary works of art in the past. Walker’s efforts saw a multitude of moving parts installed to make the train appear more realistic. Chef Polyviou said the train and the other artworks on display were sure to delight visitors of all ages. The train serves as a centrepiece in front of a pop-up candy store selling a variety of sweet treats in the lead-up to Christmas. On sale are Gingerbread Ninjas at $9.50 for six pieces, Fruit Mince Tarts at $12.50 for six pieces, Christmas Pudding at $22 each, Mini Gingerbread Lolly Bag Houses for $65 each, Caramel Christmas Logs at $85 each and Christmas Trifle at $135 each. The train will be on display at Shangri-La Sydney in The Rocks from 29 November until 31 December.